Open the base scene version for your character, that is: the scene version in which you built your character rig. In the Game toolbar, click on the Export to Easel JS button. The Export to Easel JS dialog appears. Right of the Asset Path field, click on the ... button. A folder select dialog opens. Browse to and select the directory in which you want to create your asset directory. NOTEYou do not need to create a directory specifically for your exported assets. One will be created with the name in the Asset Name field. In the Asset Name field, type in the name of the directory in which to export your assets. This will also be the name of the GameObject in Unity. To add a resolution, click on the Add Resolution button. A row will be added to the list. Double-click on each field in the new row to type in its name, its width and its height, in that order from left to right. To remove a resolution, select it in the list, then click on the Remove Resolution button. For most usages, the other default parameters in the dialog should be fine. 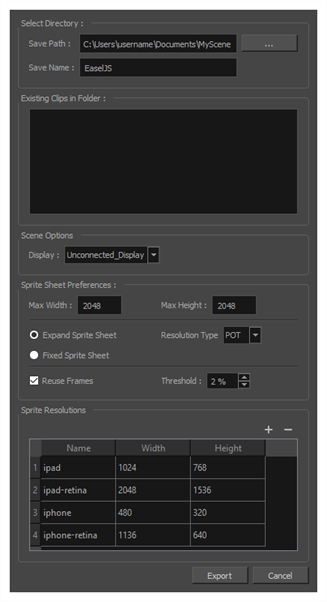 To learn more about the parameters in the Export to Sprite Sheet dialog, refer to Export to Easel JS Dialog Box. Harmony will export the sprite sheet for your base rig. Open the scene version for the first animation clip for your character. Repeat steps 3 to 10 to export the animation for this scene version. Make sure to export in the exact same directory in which you exported the sprite sheet for your base rig. Repeat for each scene version containing an animation clip for your character.